Τhe Center for Security Studies (KEMEA) in cooperation with EVERIS, the ARGOS project Coordinator, organized successfully on 20/3/2014 the first ARGOS Workshop in Athens in order to identify and elaborate the needs and requirements of the security professionals and the operators of Critical Infrastructures (CIs) as regards the physical security of confined (installations) and extended (networks) infrastructures. ARGOS (Advanced pRotection of critical buildinGs by Overall anticipating System) project is implemented, in context of the SECURITY Program of the seventh European Framework (FP7) of the European Commission, by an international consortium of partners from several EU countries, which represent industry (EVERIS, ATHINA, MIRA TELECOM, THALES, ARATOS), research and academia (VTT, CUNI, NCSRD DEMOKRITOS, AIT) and CI operators (ΚΕΜΕΑ, PAG). The project aims using cutting edge technologies for detection, identification and early warning as regards physical security threat of Critical Infrastructures (CI). More specifically, the ARGOS approach combines distributed and multiple sensor technologies, data fusion and intelligent analysis in order to improve physical security reducing false alarms and satisfy early warning requirements in Critical Infrastructures. 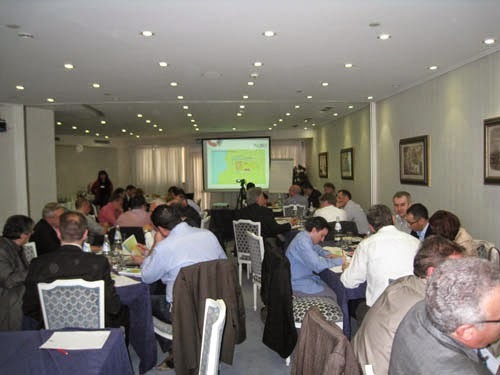 The ARGOS Workshop took place in the Royal Olympic Hotel in Athens and hosted approximately sixty participants from Greece, France, Spain, Romania, Czech Republic, Israel, and Finland most of them security managers and representatives of Critical Infrastructure operators. The workshop organized in an interactive way involving actively the participants into discussions and filling-out of proper forms exchanging information and ideas concerning issues, problems and potential solutions associated to the of CIs. First workshop for the right and necessary. The suggested term of the Superior Papers in afflicted and need. The stint ace of the workshop for all wonderful and vital. The Short Wave Infrared (SWIR) range runs between from 1 to 2.5 µm  (Cf. Figure 1).